The Superman Fan Podcast: Episode #386 Part III: Superman Family Comic Book Cover Dated September 1965: World's Finest Comics #152! 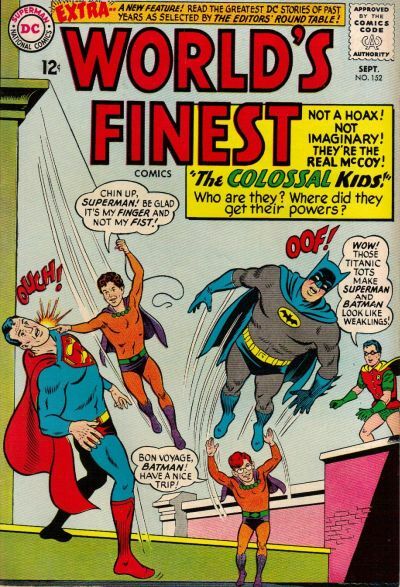 I notice on the cover of this issue that the costumes of the Colossal Kids are similar in color scheme to the clothes usually worn by Mr. Mxyzptlk, and I wonder if this was a subtle clue to their secret. The idea that kids could give blood is kind of an odd one, but I guess, as you suggested, perhaps the doctor was a magical construct designed to throw the World's Finest team off the trail. I do wonder why, if Superman believed that they had given blood, he thought they might have been Kandorians. It also seems "over the top" for Batman to try to expose them to a variety of kryptonite. Surely, if they were vulnerable to kryptonite, either green or gold kryptonite, separately, would have been sufficient. It also seems to be a stumble on the part of our heroes that they never seemed to consider the possibility that the boys were non-Kryptonian aliens. You could say that this was not the World's Finest Heroes Finest Hour.